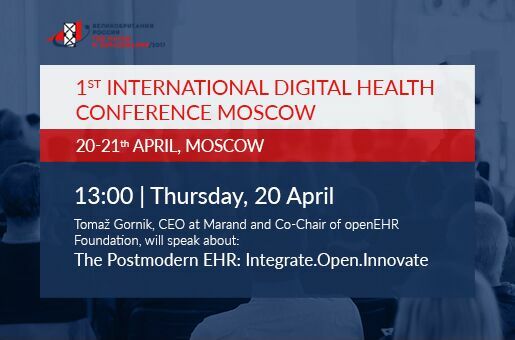 Tomaž Gornik, CEO of Better by Marand, will give a presentation on the Postmodern EHR at the first International Digital Health Conference in Russia, which is taking place on 20 and 21 April 2017 in Moscow. Gornik is one of the speakers at Session 1, showcasing the best solutions in Digital health systems and services scheduled for 10.00 – 13.20 on 20th April. The Postmodern EHR is a response to the challenge of health data interoperability. Today, the clinical data with most systems on the market is coded in the proprietary formats of commercial vendors. Therefore, moving from one system to another involves high costs of data migration, with the risk of data corruption and data loss. The Postmodern EHR solves these issues by separating data from technology and applications. New architectures promoted by Postmodern EHR enable agility, which is impossible for the majority of healthcare applications today as they are an inseparable mix of code for the user interface, decision logic, workflow and clinical data. Key features of the Postmodern EHR correspond with the latest recommendation by Gartner, stating that truly effective and sustainable open architectures will need a capacity for vendor-neutral data persistence, such as utilising a common scheme or set of archetypes and rules for managing structured and unstructured data. In his presentation, Gornik will also discuss the Integrated Medical Information and Analytical System that was launched in Moscow outpatient clinics in 2011. The Moscow project is a validation of the vendor-neutral data concept, which proves that it can be applied at any scale as Moscow’s electronic healthcare record is among the largest in the world. The first International Digital Health Conference in Russia is organised by the British Embassy in Moscow, Department for International Trade and the Moscow State University. Its objective is to highlight the growing opportunities offered by collaboration between healthcare, biotechnology and the IT industry. The conference is one of the keynote events to celebrate 2017 as the UK/Russia Year of Science and Education.